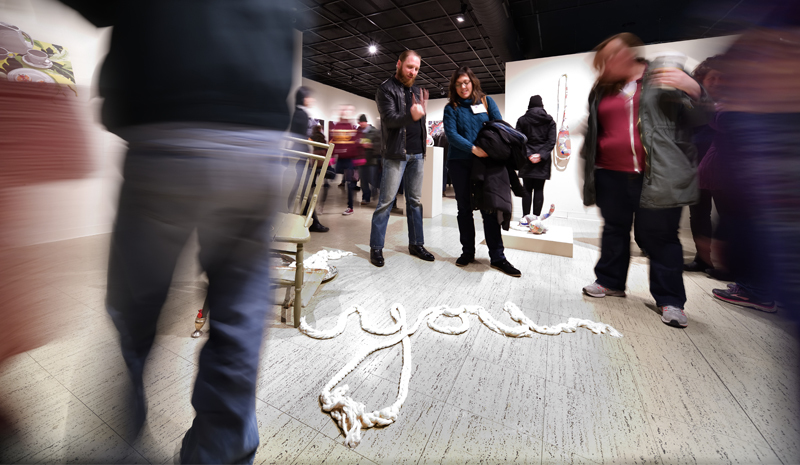 Morlan Gallery, located in the Mitchell Fine Arts Center on the historic campus of Transylvania University, presents five exhibitions of contemporary art throughout the academic year. The gallery’s mission is to expose students to the work of living artists, the latest directions in theory and criticism, and variety of diverse perspectives on human behavior and concerns. Morlan Gallery strives to be a laboratory of thinking; a place to ask questions, risk, and experiment. Morlan is located on the main floor of the Mitchell Fine Arts Center, situated just off Fourth Street between North Broadway and Upper Streets, where parking is free, close by and ample, especially after 3 p.m. Click here for our campus map, driving directions and parking lot locations. The gallery is open weekdays, noon to 5 p.m., and by special appointment. Every exhibition has limited weekend and evening hours. Locate these special days and times in the "Calendar" section. If you have questions about the exhibition or would like to arrange a group tour, please contact the gallery director at 859-233-8142. All events are free and open to the public.